Wine. Castles. Chocolate. More wine. What’s not to love? When my mom was in town she wanted to go up to Napa. I had no ability to take a day off at work so we could go sans kids. That meant we had to go on a weekend and find a child-friendly winery. 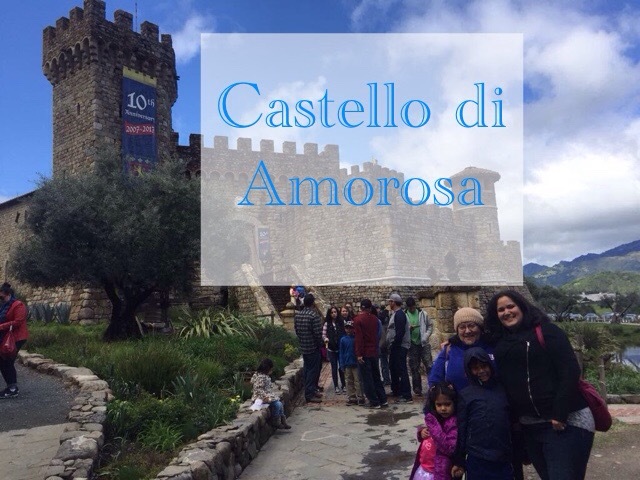 What a better choice than Castello di Amorosa, a winery that is located in a castle in Calistoga, at the top of Napa Valley. 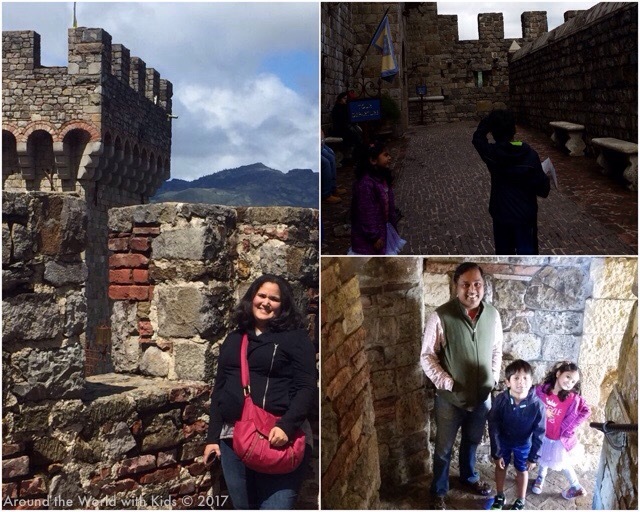 Castello di Amorosa is a labor of love by the owner, Dario Sattui. He wanted to re-create a castle in the Tuscan style. Italian artisans make the iron work, doors and windows for the castle. It took 15 years to build and was opened to the public on April 9, 2007. 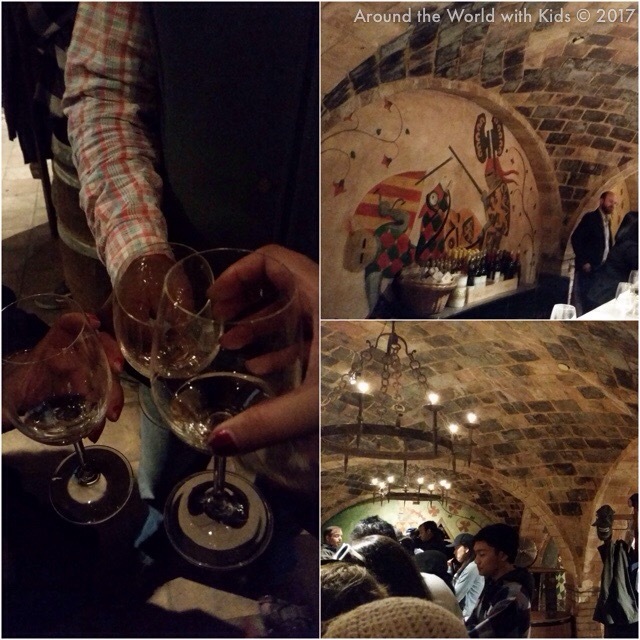 Guests have two options, they can either go on a guided tour; where a guide takes you through the castle, explains its architecture and history, and brings you to a private wine tasting at the end. 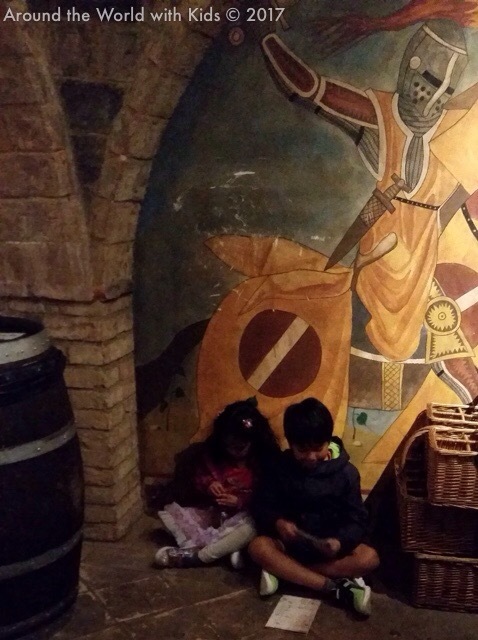 The other option is to take a self-guided tour which includes wine tasting and juice for the children. 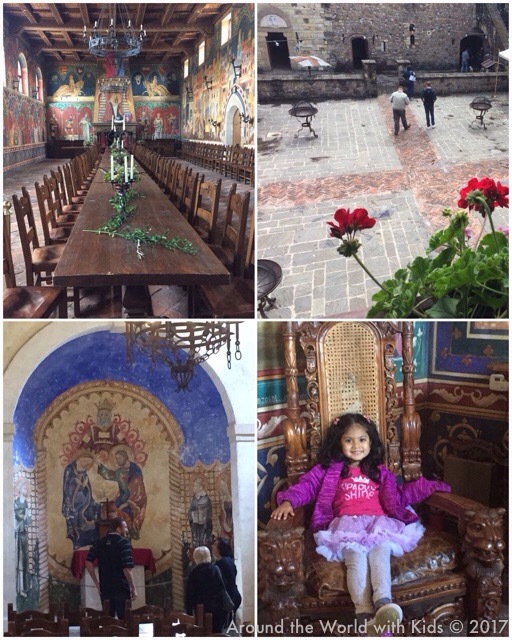 We chose to go the self-guided route since I didn’t expect my children to be still during a guided tour. My son had the map and used his new finely tuned reading skills to direct us through and tell us about the room or plaza we were currently in. 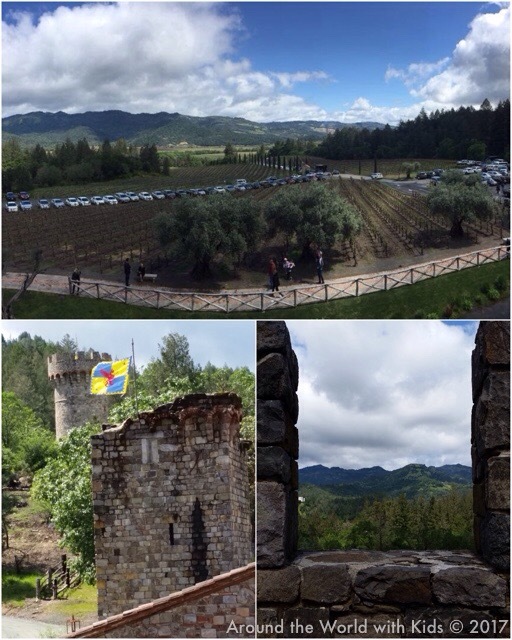 The outside has tons of neat nooks and crannies to explore, towers to climb, and views of the beautiful Napa Valley. More inside the castle is the courtyard and a number of rooms that are made to resemble a Tuscan castle in the 13th century. The Great Hall is exquisitely painted with a wall to wall mural, long dining table, and replicated antique furniture. The Chapel has an altar, benches to pray, and an area to light candles, where donations are given to a local charity. There are rooms providing wine education and a video on the pressing technique, as well as Fattoria, a quaint gift shop. The tasting room did have a table full of coloring activities, but it was a bit too far from where we stood at the bar. I didn’t trust my kids to sit there unsupervised and not move away (and accidentally break something in the beautiful gift shop). So I sat them in a corner and gave them some coloring packs I picked up at the dollar store. Between the juice and coloring, they were perfectly content with themselves. I do want to mention the amazing staff that they have. Hosts take you to the wine bar and make sure you have a spot that will fit the adults. The hosts both noticed my daughter, who was particularly cheeky that day with her fluffy skirt and fawned on her calling her the princess of the day. My sensitive son was jealous, and asked the host “Is there a prince of the day?” Immediately recognizing the situation said “Of course; you are! Now, what do we get the prince and princess?” Then she went back and got a small chocolate for each of them. I was very impressed and grateful that she went out of her way to help. After the tasting, we walked around the grounds a little outside, enjoying the sunshine and the beautiful view of the castle and the valley. Then we went back to our car, and climbed in, preparing for the long drive home. 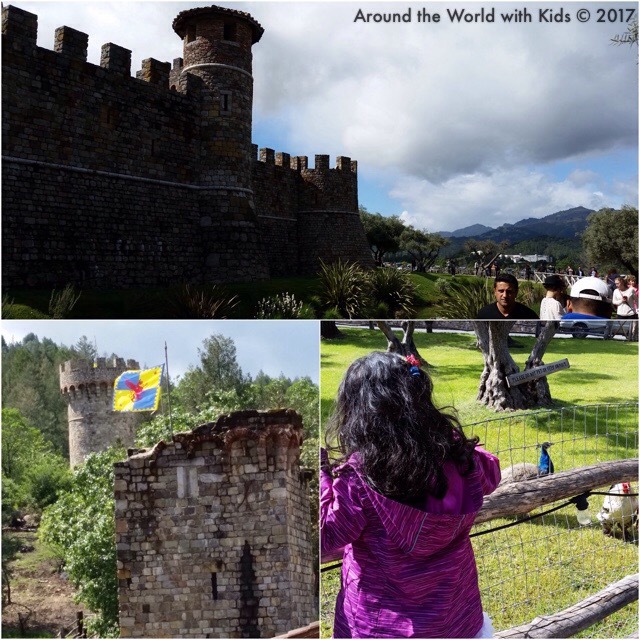 The two children were out like a light before we even left the parking lot, and I was not far behind them, dreaming of castles, knights, wine, and the romance of Tuscany and Napa Valley.